How do I make sure my horse is getting enough vitamin E in his diet? 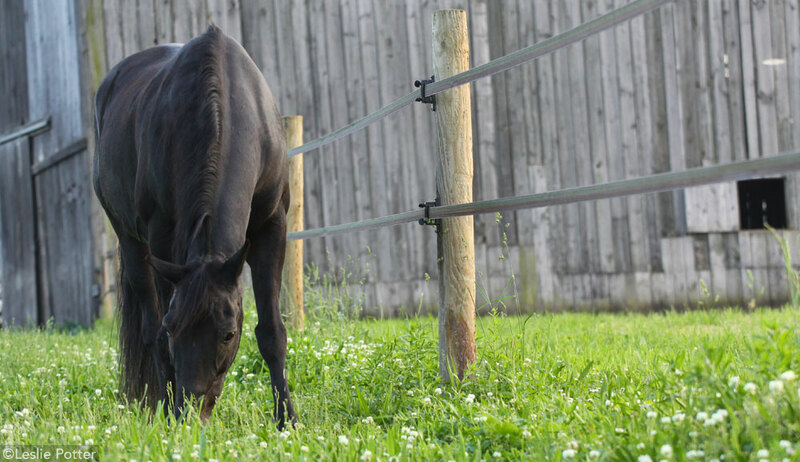 Q: My vet recently told me that my horse should be on a Vitamin E supplement since he has no access to pasture. I went online to research my options but now I’m SO confused! There seem to be a lot of different forms of vitamin E, how do I know which one is best? Some forms claim higher bioavailability than others, but what does that even mean? Thanks for helping me sort this out! Fresh pasture is a natural source of vitamin E. When good grass is unavailable, supplementation may be beneficial. A: You’re not alone; many people find vitamin E to be one of the most confusing nutrients. Let’s start with the basics. Vitamin E is included in the category of fat-soluble vitamins along with A, D, and K. These four vitamins require fat for them to be absorbed from the digestive tract, and are stored in the liver and fatty tissues. Like vitamin A, the body does not make any vitamin E, meaning all of it has to come from the diet. Vitamin E is expressed in terms of “activity,” and the NRC or National Research Council recommends 1 International Unit (IU) of vitamin E per kilogram of horse bodyweight. So a 500 kg horse (1100 pounds) would need at least 500 IUs/day of vitamin E. While the upper safe diet limit has been set at 1,000 IU/kg dry matter (that’s 10,000 IU/day for an 1100 lb horse), fortunately vitamin E does not appear to be toxic to horses even at relatively high intakes. Vitamin E is an antioxidant that works closely with selenium and vitamin E to protect cells from excess free radicals or oxidative stress. While every horse needs vitamin E, certain conditions have been associated with a deficiency of vitamin E or as requiring more vitamin E than normal such as Equine Motor Neuron Disease and EPM. Found in high amounts in fresh pasture, levels of vitamin E begin to deteriorate the moment forage is cut for hay. Therefore, horses that do not have access to grass or a full serving of fortified grain should receive vitamin E supplementation. Now we’re beyond the basics! You may have heard of “natural” vitamin E and “synthetic” vitamin E. On a product label, natural vitamin E appears as d-alpha tocopherol; synthetic vitamin E appears as dl-alpha tocopherol. Although synthetic vitamin E is absorbed by the horse, natural vitamin E has been shown to be more biologically active. That is, it takes a smaller amount of d-alpha tocopherol to achieve the same activity in the body as dl-alpha tocopherol. So it ultimately comes down to your choice whether you want to feed a small amount of the more expensive natural version or a larger amount of the less expensive synthetic version. Because the appropriate vitamin E level in the body (measured as serum alpha tocopherol) is so critical to cellular health as well as normal function of muscle and nervous tissue, it’s important to choose a supplement that you can be confident is being absorbed. Some supplements have research that demonstrates this. Alternatively, you might want to ask your veterinarian to draw a baseline blood sample before you start your horse on a vitamin E supplement and then measure serum alpha tocopherol again about two weeks later, to see if there’s a significant difference. Because alpha tocopherol is a fairly fragile compound, it’s important that your veterinarian follow special protocols to protect the sample from destruction before the laboratory has a chance to analyze it, or the results will be falsely low. Things like the wrong type of tube, exposing the sample to light, letting it get too warm, or repeated freeze/thaw cycles can all damage vitamin E in blood samples.